Any quantity only $1.69 per oz over spot! A lot of new private mints have opened their doors in recent years amid the Great Recession and the surge in demand for precious metal products. London’s Royal Mint has taken an alternative approach, reviving a minting brand to release new silver rounds for investors and collectors interested in low-premium prices. Right now, the 1 oz Silver Royal Mint Refinery Round is available on Silver.com. All-new release available on Silver.com. Marks the revival of the Royal Mint Refinery brand. Arrives in an individual plastic flip or sealed tubes of 20. Trans-Atlantic partnership between the Royal Mint and Elemetal Mint. Silver rounds are increasingly popular right now because demand for silver products is high, and silver rounds are available at much lower premiums over the spot price of silver. Bullion and proof coins from sovereign mints have higher premiums, making silver rounds more attractive to some investors and collectors. On the reverse side of the round you’ll find the image of a bald eagle atop a shield, with its head bowed in respect. 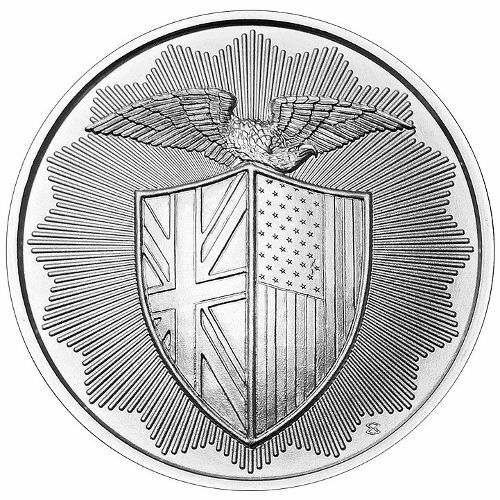 The shield bears the flags of the both the United Kingdom (left) and the United States (right), as a symbol of the cooperation between the Royal Mint and Elemetal Mint. 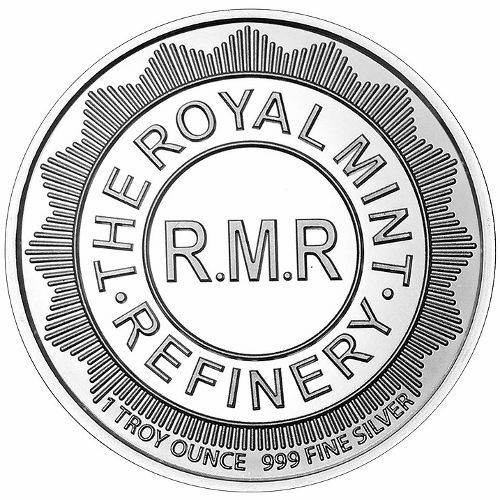 The obverse side of the round has the brand logo of the Royal Mint Refinery, which includes “RMR” in the middle of the design and the words “Royal Mint Refinery” encircling it. Also included on this side are engravings of the weight, purity, and metal content of the round. Both sides of the 1 oz Silver Royal Mint Refinery Rounds available for sale on Silver.com today have sun-burst rays in the design that act as an enhanced security features. The rays feature micro-laser engraved radial lines that inhibit the ability of counterfeiters to reproduce the rounds. If you have any questions about these rounds, please feel free to contact Silver.com at 888-989-7223. You can also reach out to us online using our live chat and email features.